The work is a part of the artist’s “Servicios Migratorios (Immigration Services)”, a presentation of devotion to the Virgin of Esperanza (Hope), Mother of Immigrants, as an aid for illegal immigrants in obtaining the papers which would allow them to remain in the United States with legal status. 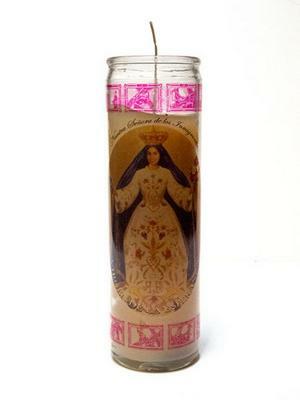 The piece shown here is a devotional candle with the image of the Virgin on the front (here with the features of the artist herself). It includes the saint’s attributes: passport, green card, and money in hand. "By placing an image of myself holding an American passport, money and a green card on the ubiquitous I created a figure named “Santa Esperanza” (Saint of Hope), the patron of the immigrants. This iconoclastic work comments on the American dream and the notion of the `self-made man’ as well as its (paradoxical) transformation into an object for devotion, prayer and desperate hope."